King Juan Carlos of Spain is abdicating from his position as head of state on Monday. The king's decision was announced to the nation by Prime Minister Mariano Rajoy, who called a press conference at short notice on Monday to make an "institutional declaration." In a brief declaration to the press in which he accepted no questions, Rajoy said: "His majesty the King Juan Carlos has just told me his will to renounce the thrown and to open the succession process." 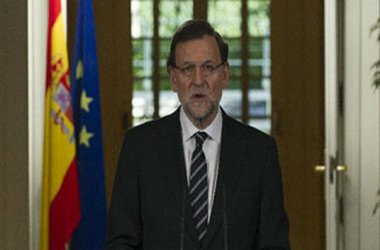 Rajoy added the king would "personally communicate his decision to the Spanish people on Monday morning." At the same time Rajoy spoke, the Spanish Royal household posted a photo on twitter showing King Juan Carlos signing the paper which saw him officially renounce the throne. "I want to say that I have found the king convinced that this is the best moment for this change in the head of state and the transfer of the crown to the Prince of Asturias to happen," said Rajoy. "I will call an emergency cabinet meeting Tuesday with the aim of completing the constitutional previsions," he added. The 76-year-old monarch was named as king of Spain on Nov. 22, 1975, two days after the death of General Franco, who had nominated him as his successor. Along with the recently deceased Adolfo Suarez, the king embarked on a process of bringing democracy to Spain and was a key figure in the failed military coup of Feb. 23, 1981 when he made a television broadcast asking for the unanimous support of the democratic government. However, the king's popularity declined in recent years. Juan Carlos was heavily criticized for extravagant vacations while his country was suffering the economic crisis. He also suffered a series of health issues, such as a benign tumor which he had removed and a broken hip, which he suffered in April 2012 while elephant hunting in Botswana. The monarch later took the unprecedented step of apologizing to the nation, although that did little to save his popularity from falling to the lowest levels of his reign. Juan Carlos will be succeeded on the throne by his son, 46-year-old Felipe Juan Pablo Alfonso de Todos los Santos de Borbon, the Prince of Asturias, who will become King Felipe VI.